An inspirational interview with the most unusual bodybuilder I have met. 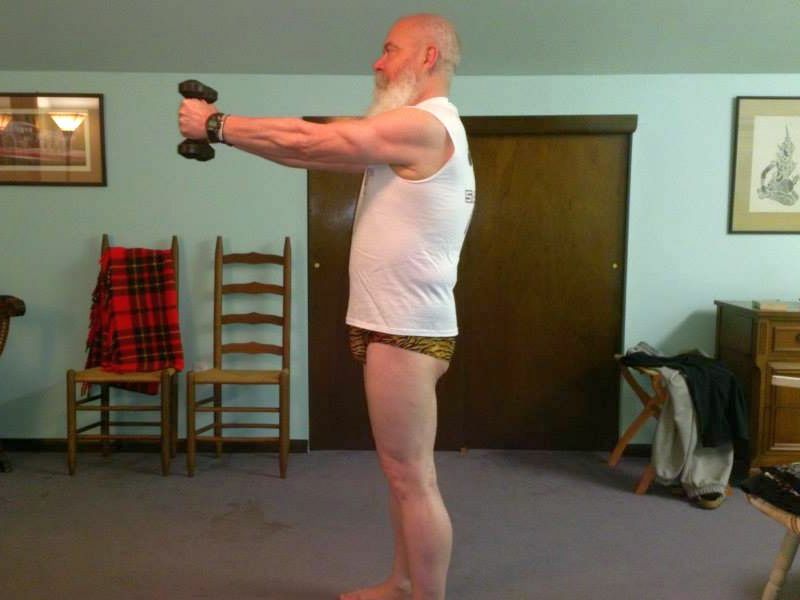 A Bodybuilding Monk On Facebook? I made the acquaintance of Prior Aelred when he sent me a friend request on Facebook, stating he was a great admirer of Victorian strongman Eugen Sandow and follows his workout plan. “Prior” had me stumble, because it wasn’t a name, but a title I recognized from my hazy knowledge of Catholic monasteries. His profile picture showed a man somewhere over fifty with a voluminous greyish beard. And sure enough one wearing a monk’s habit. Intrigued I accepted Aelred’s request and surfed over to read his full profile. 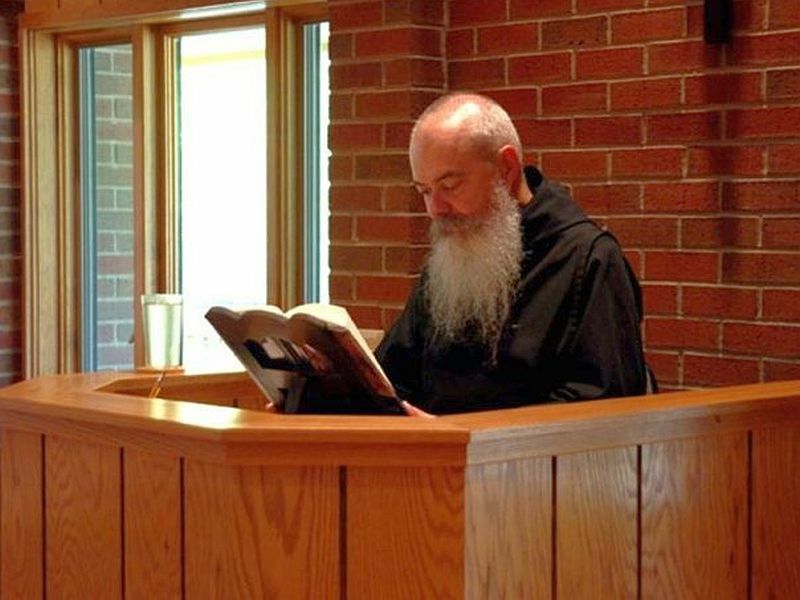 It turned out that he was indeed a monk, actually over 60 and lives at St. Gregory’s Abbey located in Three Rivers, Michigan. Prior Aelred acting as refectory reader. A man over 60, living a celibate life in a monastery, but active on Facebook, enjoying worldly fun like Calvin and Hobbes comic strips? And an avid bodybuilder on top? Prior Aelred breaks many preconceptions. For readers not well-versed in the daily goings of a monastery, can you tell us what your role and duties at St. Gregory’s Abbey are? Since I entered in 1975, I have worked on the farm and in the garden and the woods. I have written articles and sermons and published one scholarly paper. I have worked with bees. I have been in charge of keeping the mailing list up to date. I have been archivist. I worked with architects and contractors in the construction of new monastery buildings. With fellow monks at St. Gregory’s. For over thirty years I have been Novice Master and in charge of the summer vocation program, teaching classes and having conferences. For nearly thirty years I have been Prior (assistant superior). For over twenty years I have been a priest. And for over a year now, the monastery cook. When and how did you first become interested in working out and bodybuilding? When I came here I threw enough hay bales and swung an ax often enough that I never gave a thought to working out. But after my occupations became more sedentary and I started to age, I happened to stumble and fall, landing very badly on my rotator cuff, so that I could not move my shoulder. My doctor thought I would need surgery, but the insurance company insisted on trying physical therapy first. It was a slow, painful process, but eventually I was working that shoulder with light dumbbells and resistance bands. But I didn’t keep that up. I was scheduled to visit a friend and knew I wasn’t going to take any equipment with me. But my friend had been a runner and had once given me a pair of running shoes that were a little too tight for him. So I put them on and started running. I ran year round, never farther than eight miles, but ran rain or shine or snow — up to thirty miles a week during summer with its long daylight (although I also ran in the dark — Fr. William gave me a reflector vest). Until the time that I slipped on the ice and broke my leg. Suffice it to say that during my recovery, I looked forward to getting back to running. I tried, walking first, then running short distances, but something wasn’t working. The flow was gone. About that time the Smithsonian Magazine had an article about Charles Atlas. When I was a child, ads for the Charles Atlas exercise course were on the back of almost every comic book. I read the article with interest and found out that the course was still available and I ordered it. I worked the program hard. I am not supposed to reveal the secrets of the course, but the real beauty of it is the constant encouragement and the emphasis on health and good health as a complete way of life (there are sections on nutrition and rest as well as exercise). But basically, it is calisthenics and eventually one will plateau. When I was up to 400 push-ups a day and my arms weren’t growing, I wanted more. I researched weights and muscle-building exercises with heavier weights and protein powder and other supplements. I did get a little bigger, but I lost my abs. Too much of the weight I put on wasn’t muscle. And I did some more injury to joints and tendons. The heavier you lift, the more important perfect form becomes. No one ever has perfect form 100% of the time. So I tried other body weight exercises (for a time I was doing 110 Hindu push-ups and 230 Hindu squats daily), but eventually I discovered Eugen Sandow (the “father of modern bodybuilding”) and some of his books which were just coming into print after an interval of over a century. Sandow claimed that the best way to exercise was light dumbbells (3-6 lbs). I still had light dumbbells from my rotator cuff therapy and decided to give Sandow a try. For a couple of years now that has been my basic exercise and I am very happy with the results. Monday, Tuesday, Thursday & Friday Eugen Sandow’s exercise routine. In accordance with Sandow’s instructions, 5 lb dumbbells are used throughout. The important thing is that the dumbbells be squeezed tightly and tension is focused on the muscles being exercised. These exercises take about fifteen minutes. Calf raises on outside stairs. Sunday is a day off from exercise (I have plenty of work in the kitchen). Does life in a monastery impact how you work out? I think this has been adequately covered by explaining the monastic schedule. I have to have a brief workout to fit it into our daily routine. How do your fellow monks react to your fitness efforts? Hardly at all, except asking me to open jars. Once one of the monks saw me without my shirt on and said, “You are built.” On the other hand, other people have commented on my arms or legs or told me I had a great physique. One fellow asked me if I took steroids. My doctor tells me I am in very good shape for a man in his mid-sixties. You are a fan of old-time strongman Eugen Sandow. What fascinates you about him? Sandow was the first in many ways — to promote proper exercise as a general aspect of good health for everyone — to open health clubs for the general public (not just weight rooms for boxers and strong men) — to market correspondence courses — to sell exercise equipment not only for athletes but for the ordinary man and even for women and children — to prescribe exercise by repetitive movements with light weights rather than just lifting the heaviest weight you could manage and then waiting a couple of minutes and trying to lift it again — to organize a nationwide “bodybuilding contest” (with trophies topped by a statue of himself — a tradition continued in the Mr. Olympia contest) — to become famous not just for how much weight he could lift but for how his body looked (there were theories that the ancient Greek statues were idealized because it was not possible for a real human being to have a body that looked like they did). Doing Eugen Sandow’s standing flyes exercise. Do you think that physical fitness has a spiritual component? Yes — “mens sana in corpore sano” [“a healthy mind in a healthy body”] is from Juvenal, but I think the body, spirit, mind connection is obvious to anyone who has reflected on it (or experienced it). Last but not least, what workout advice would you like to tell my readers? The basics are diet, exercise and rest. The specific factors are your goals (winning the Olympia and winning a Marathon are very different) and what works for you. You need motivation to accomplish your goals. If you have the greatest exercise routine in the world but don’t do it, it will do no good. If you have a basic workout that you like and that you can fit in to your life and that works, that is great. Changing things takes effort and motivation is the key. Many thanks to Prior Aelred for this interview! Bible image courtesy of “Robert,” pictures of Prior Aelred courtesy of Prior Aelred and Jack Ohlemiller. Wow – impressive that he fits it all in. I like the creativity on the workouts! I don’t know if I could do it, if I had that much on my plate! There is no way I could do those arm dips and I’m a good 15 years younger…..thanks for being an inspiration Aelred – now I have something to aim for!